So far this month we've worked our way through several new soups and one new chili, so it's time to add a stew to the mix. 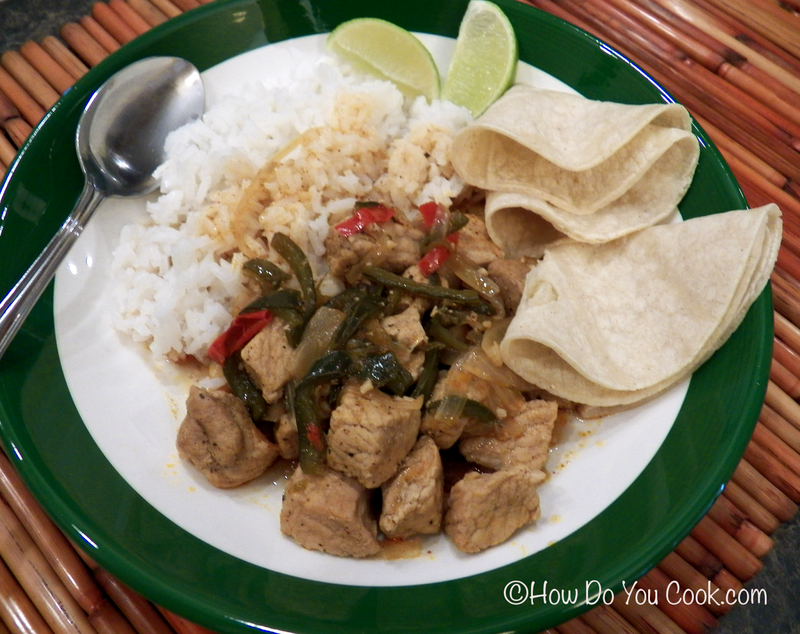 For day 11 of Soup Month 2014, we made a quick and easy Mexican Pork, Poblano and Serrano Chili Stew. This is a great way to make something different than the usual tacos for a Mexican dinner night and, it won't take very long to prepare. This meal can be ready to serve in less than an hour. My favorite part of this recipe is the mix of the mild poblano peppers and the spicier Serrano peppers, and the way they come together to create such a bright pop of flavor. Some people have told me they hesitate to buy fresh peppers at the grocery because they see a price $3.99 per pound for Serrano peppers and they think this is too much to spend. The reality is, since you only use 2 or 3 Serrano peppers, and they weigh very little, those peppers are going to cost you around 60 cents. Very little cost, but lots of fresh flavor. That's a bargain. We served our Mexican Pork Stew with a scoop of steamed white rice, or you could use brown rice, and a squeeze of fresh lime juice over the top. We even tried a spoonful of Spicy Guacamole with this and it was delicious. Serve with warm corn tortillas on the side and Enjoy!! In a large soup pot, heat the olive oil over high heat until shimmering. Season the pork with salt and pepper and add the pork to the pot. Cook the meat over high heat, stirring occasionally, until browned on the edges, about 5 minutes. Add the onion, peppers, garlic, chili powder and cumin to the pot and stir. Continue to cook the vegetables over high heat until softened, about 5 minutes. Add the broth to the pot and bring to a boil. Reduce heat to medium-low, cover the pot with the lid slightly ajar, and simmer until the pork is tender and the broth is reduced by about half, about 20 minutes. Season the stew with salt and pepper, if needed, and serve with steamed rice, lime wedges and warm corn tortillas. This was a great meal and I was so pleased with the results. I hope you get to try it. Thanks for visiting! !